Picks up and holds dirt, dust, pet hair, and large particles and crumbs. 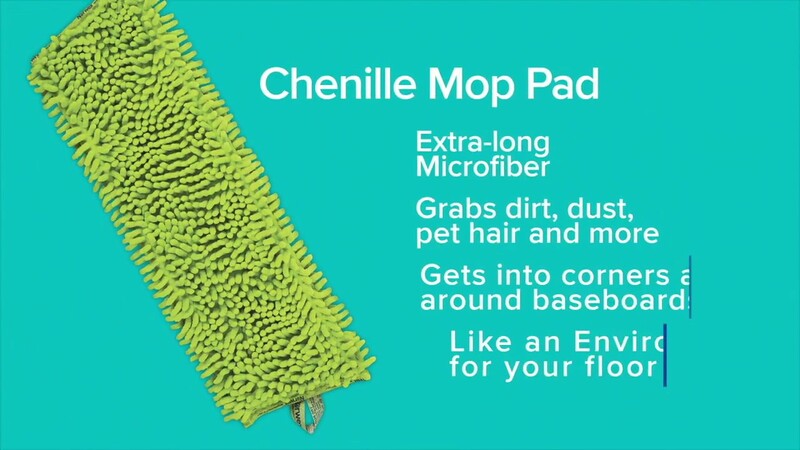 Made from extra-long nubby chenille microfibre, the Chenille Mop Pad is statically charged and great for cleaning dry floors, walls and baseboards. Dry mop first, attaching a Chenille Dry Mop Pad to the Velcro® on the aluminium Mop Base. Adjust the Telescopic Mop Handle to chin height and twist the outer handle clockwise to lock. Dust the edges from the back of the room toward the door, then move the Dry Mop Pad in a figure 8 pattern, keeping the leading edge of the mop forward at all times. This keeps all the dust on the same side of the mop. Brush the collected dust and hair out of the mop using the Rubber Brush directly into the rubbish bin.